The University of Auckland degree and photo frames are available during Graduation, or from Factory Frame retail outlets/ online store throughout the year. 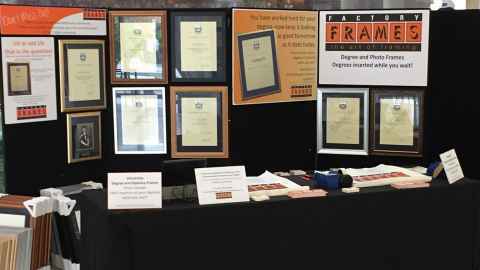 Frames can be made bespoke or you can select from the standard University of Auckland degree size frames (280mm x 380mm). Backing boards and mat surrounds for degree and diploma frames are made of environmentally-friendly acid free materials. There are numerous frame finishes/colours for you to select from and frames are available with three different glass options: standard clear glass, non-reflective glass and UV Filtering glass.